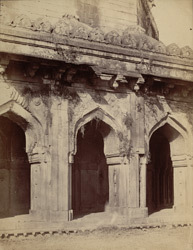 This photograph was taken by Joseph David Beglar for the Archaeological Survey of India in the 1870s. The tomb is that of Hasan Khan Suri, father of Sultan Sher Shah Suri, at Sasaram. This city in Bihar served as capital for the Suri dynasty between 1530 and 1540 before the move to Delhi for the remaining five years of Suri rule. The largely grey sandstone tomb was designed by the architect Aliwal Khan and built between 1540 and 1545. It is octagonal in plan and is topped by an impressive dome surrounded by ornamental domed kiosks. There is an single-storey verandah running around its circumference, with three arched openings in each side, that creates an ambulatory around the central octaganal chamber within. One side of this verandah is shown in this photograph.